Özyeğin University offers German classes from A1 to B1 levels. Students are provided a solid grammatical foundation along with the topics covered in the textbook and offered the opportunity to put their knowledge in practice in different everyday situations. Students who take German classes at Özyeğin University gain a significant advance over their counterparts in their job search process. Berk Gülek from Mechanical Engineering Goethe CEFR A2 Certificate from the Goethe Institute. 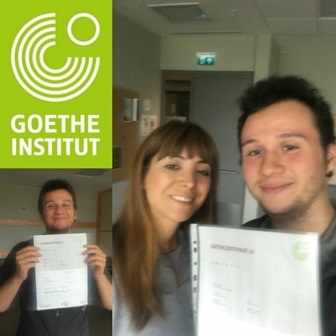 We congratulate our student and his German Instructor.